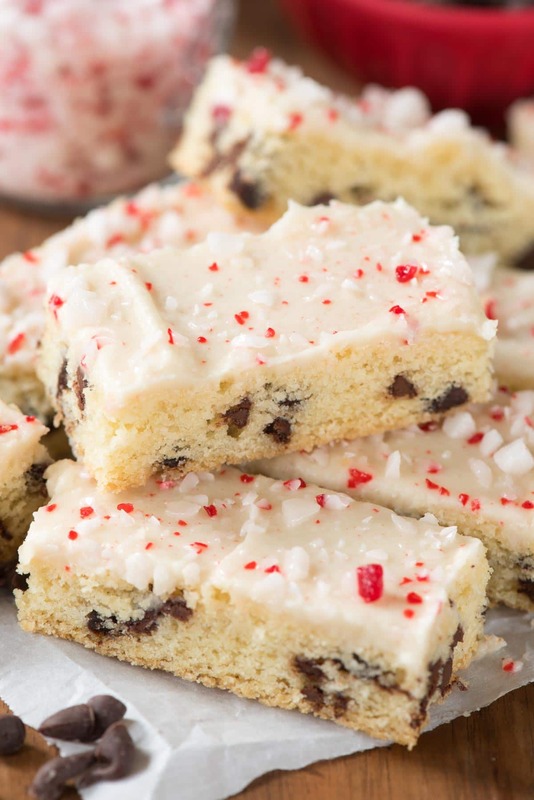 Peppermint Chocolate Chip Sugar Cookie Sticks are the perfect Christmas cookie recipe! 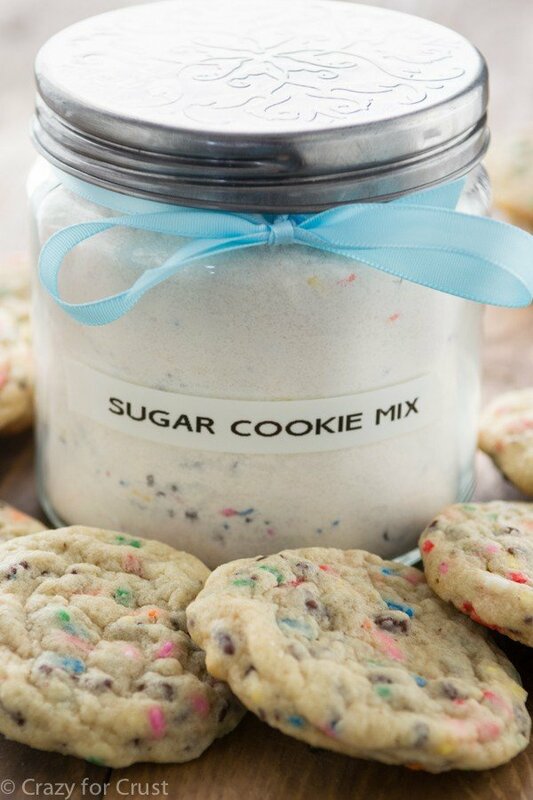 Chocolate chip filled sugar cookies with a hint of peppermint! Well, y’all, it’s begun: my crazy frenzied holiday baking has started! I know, you’d think that, being a dessert blogger, I’d already have tons of cookies and bars in my freezer from August all ready to go, but nope. Not this year; this year I all of a sudden realized my freezer was empty and holiday gift giving starts…now. I think I got thrown off because Jordan doesn’t get out of school until December 22 this year. Normally I have an entire week without her in school to get the last minute baking done…this year that IS the last minute. Now I’m hurriedly turning out cookies and bars and candy to freeze and store for the next few weeks of family visits, parties, and gift giving. One of the reasons I love these sugar cookie sticks is because they’re so easy to make and they make a huge batch; there are 64 if you cut them the way I have. That goes a long way when you’re making cookie platters for all of the people on your list! 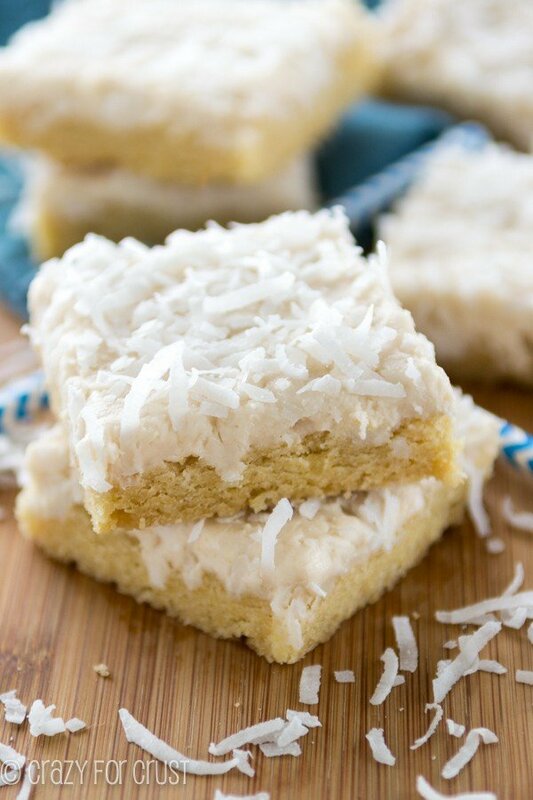 I started these bars with my favorite sugar cookie recipe. I added mini chocolate chips and peppermint extract to the batter and then I baked them in a 10×15″ jelly roll (cake roll) pan. If you haven’t gotten one of those yet, be sure to ask Santa for one. They’re super versatile. If you don’t have one, you can use a 9×13″ but they’ll be thicker (and yield less cookies) or use two 9×9 or 8×8-inch pans. Then I frosted them with the perfect cookie icing and sprinkled the tops with crushed candy canes. 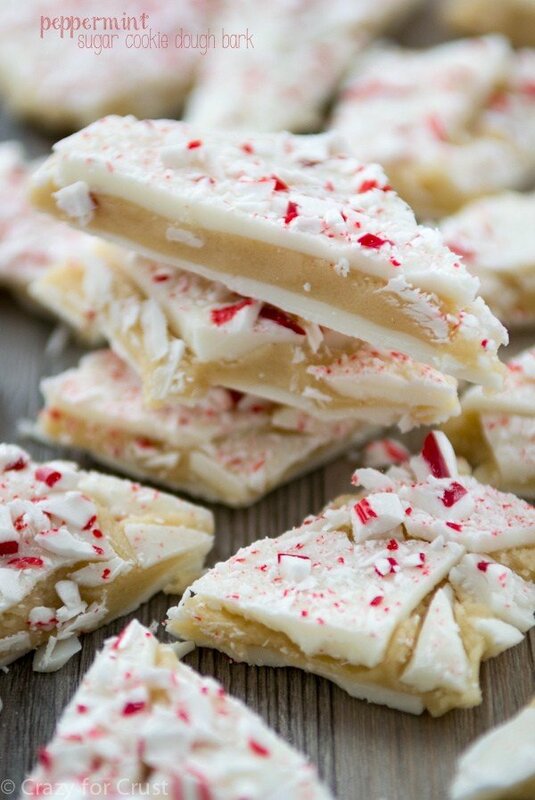 Peppermint chocolate chip sugar cookie sticks have the perfect peppermint bite! Now that I’m into the holiday baking spirit, I’ve been shopping up a storm too. The other day I spent over $100 on baking supplies at Target. The checker was all, “Doing some baking?” and I was like, ” You have no idea.” I think I bought 20 packages of chocolate chips and 5 pounds of butter that day alone! When you’re thinking about ingredients for your holiday baking, be sure to look for Challenge Butter. As you know, it’s my favorite and I always have some in my fridge (unsalted for baking, salted for my Dad when he visits). It’s 100% real cream butter with nothing artificial, no hormones, attitudes, or fillers, and if you’re in California, it’s local! 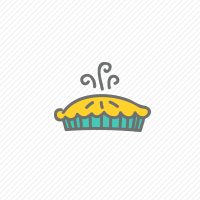 You should always use the best tasting ingredients in recipes like sugar cookies and frostings because the taste of the butter really comes through. The other thing I love about these Peppermint Chocolate Chip Sugar Cookie Sticks is that you can make them so many different ways. Use ANY extract you like if peppermint isn’t your thing. I’m sharing the recipe for the peppermint chocolate chip sugar cookie sticks over on the Challenge website today. Be sure to click over and get the recipe! 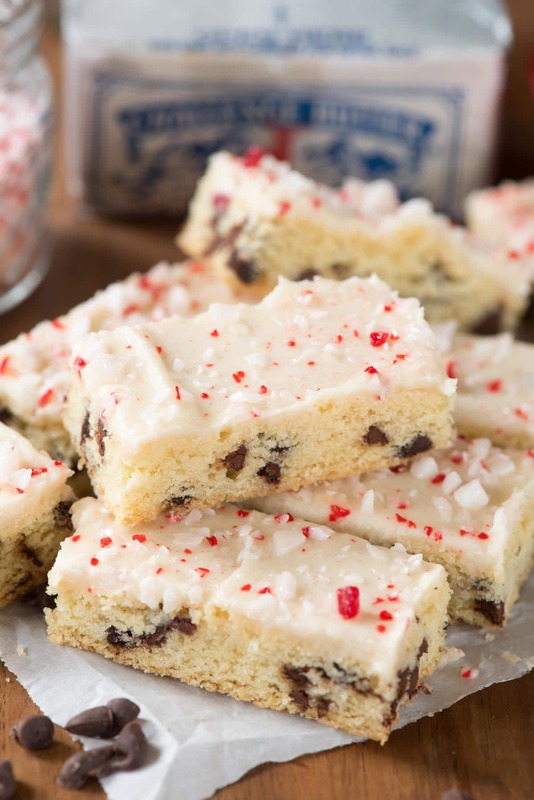 These Peppermint Chocolate Chip Sugar Cookie Sticks are the perfect Christmas cookie recipe! Chocolate chip filled sugar cookies with a hint of peppermint! This post is sponsored by Challenge Dairy. All opinions are 100% my own. I know I would LOVE these! They’d be so gorgeous on a cookie platter! i just love bar cookies! we are doing a bunch of baking this weekend, and I’m throwing this recipe into the mix! These look amazing. I love to have these right now. Yum! !